Check our our Arduino Kits. Kits include an Arduino board and the components you need to get started fast. 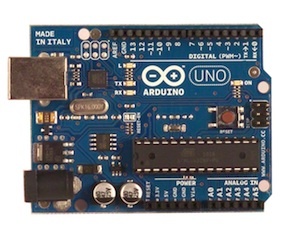 We now also have available an Arduino Uno close called the DFRduino board here. It does everything the Uno board does, at a lower cost. Arduino Uno board, Rev 3, with free 6' USB 2.0 cable! Most Arduino distributors do not include the required USB cable with their boards, but we do! The Arduino Uno is the latest version of the open source microcontroller board based on the ATmega328. The programming software is free and open source.